A food I don't understand is Poi. My college roommate was born and raised in Hawaii, (no, his name doesn't start with Barack O), so he was always receiving CARE packages from home filled with bizarre and exotic foods. One of those foods was poi. Poi is crushed, cooked taro root that when "properly" prepared forms a thin gruel. It's typically purple in color and is basically liquefied starch. The taste is commonly described as something close to glue or paste. I think the Elmer's people should file for an injunction; there is no way poi tastes as good as Elmer's glue. Besides poi, my roommate introduced me to sashimi and sushi long before it became the ubiquitous presence it now is. I returned the favor by bringing him home for Thanksgiving every year. One of his favorite dishes was my mother's mashed potatoes. He loved them because they were "lumpy". To him lumpy mashed potatoes were good, it meant finding small bits of potato that you could actually identify and not just some over-processed paste. Cut the bottom 1/4" off the garlic heads, (you want to cut enough off of the base to expose all the garlic cloves). Sprinkle the water on a sheet of aluminum foil. Place both garlic heads, cut side down, onto the foil. Sprinkle with the olive oil. Close the sides of the foil, forming it into a loose pouch. Place the pouch on a baking sheet and bake for 60 minutes. Remove from the oven and allow to cool (while still sealed) for 30 minutes. When removing the garlic heads, you may want a spatula on hand to help lift any stray cloves from the foil. Squeeze the heads into a medium sized bowl. Remove any garlic paper that drops into the bowl. Mash with a fork. Set aside. This step may be done 1 to 2 days ahead. Place diced potatoes into a large pot. Fill with cold water to just cover the potatoes. Add a generous pinch of salt. Bring to a boil. Reduce heat to a simmer, partially cover the pot and cook for 15 - 25 minutes. Note: The cooking time will vary based on the amount of potatoes you're cooking and the size of the diced chunks. The bigger the chunk or greater the amount of potatoes, the longer the cooking time. The potatoes are done when they are tender and crumble when pierced by a fork. Remove from heat and drain the water. Return to the stove top and allow to cool slightly (about 3 minutes) with the lid off. Add the butter and start mashing, stir the mashed contents from time to time. When the butter is melted and incorporated, stir in the milk and cream. Add the roast garlic and mix thoroughly into the potatoes. Note: It's up to you to decide how smooth you want your potatoes. It's up to you to decide if you want more or less butter, or more or less milk and cream. These are the personal preferences that make this side dish your own. Play with it. 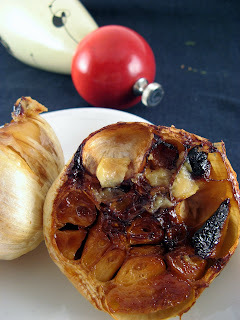 Other Notes: Bring the roast garlic to room temperature before incorporating. Also, if you remember, slowly warm the milk, cream and butter before adding to the mash. OK, crablings, remember these are my ratios, they may not be yours. You may like things drier or moister. Also, there will be visible bits of roast garlic in the mash, (as you can see from the photo), this only adds to the homemade rustic nature of the dish. Relax, the taste is worth it. Until next time, remember, you can do it, you can cook. Sounds great. 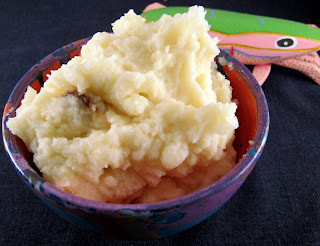 I usually throw crushed garlic into gratin potatoes, but haven't tried it in mash. Funny, from time-to-time my mum still sends us emergency ration packs (! ), though when we were first married, we always took the cans of tuna she sent for the...cat!! bizzare! Yum, perfect for the holiday season. I definitely plan on roasting garlic for the mashed potatoes this year.